Developers, makers and enthusiasts building Internet of Things projects may be interested in a new Internet of Things adapter created by electronics expert Paul Swindells, based in the United Kingdom. 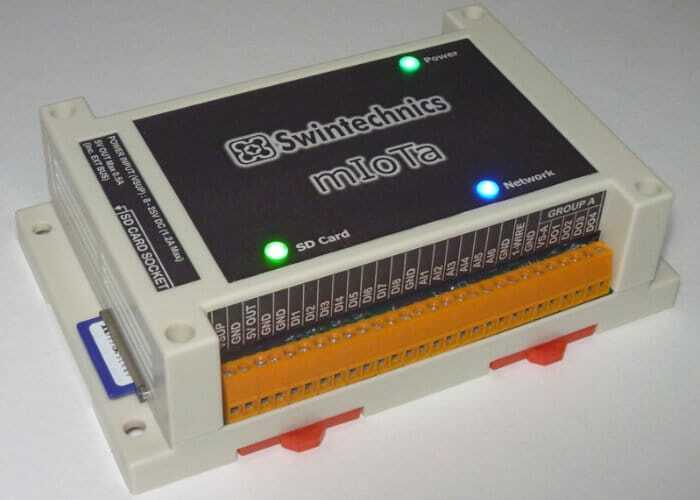 The mIoTa IoT adapter has been designed to provide an easy-to-use device that helps “simplify the creation of network connected, automated and monitoring projects for ‘Makers’ of all kinds” says Paul. Watch the demonstration video below to learn more about the unique Internet of Things development board. The mIoTa Internet of Things adapter is now available to back via Kickstarter with earlybird pledges available from £108. The campaign is successful and manufacturing progresses smoothly shipping is expected to take place during February 2019. – 8 digital inputs for anything with an on/off state such as switches, proximity sensors, pressure pads and Security PIR sensors. – 8 powerful digital outputs that can be programmed in many different ways. Each output can push and pull current to operate relays, bulbs/LED’s, solenoids, motors etc. Each output can be set to PWM (Pulse Width Modulation) mode to perform motor speed control, bulb/LED dimming, or Servo mode to control up to 8 servos. Four outputs can be combined as a group to operate a stepper motor. – 6 analogue inputs to measure the output voltage from devices such as light sensors, potentiometers, photo voltaic cells, batteries. – A 1-Wire© Bus that allows the connection of hundreds of devices such as temperature sensors, switches and RFID tags, on a bus consisting of just two or three wires that can stretch up to hundreds of metres. – An RS232 interface, to connect serial devices such as pan/tilt/zoom (PTZ) camera platforms, GPS sensors and update older legacy equipment with a smart network connection. – WiFi and Ethernet to connect to a local area network (LAN) to serve dynamic web pages and communicate with mobile apps. It can even create its own network to have direct control in the absence of any other network. – SD Card slot to store the web pages, the user software and other user data that he or she may want to store, such as temperature/weather monitoring data or GPS position data. – A serial expansion port for future add-on’s, because this is just the start! – LED indicators for power, SD Card, and Network link status. – Housed in a tough ventilated plastic case (width:145mm depth:90mm height:40mm). Has four mounting holes or can be DIN rail mounted with the spring loaded clips. For more details and to make a pledge jump over to the official Kickstarter crowdfunding campaign page by following the link below.